If there's anything to be the pinnacle of modern and thoughtful office-to-happy hour attire, this outfit is it. Line & Dot jumpsuit (currently on sale! Also navy one here). Rachel Comey blazer (old. Similar here). Dogeared necklace. Dogeared earrings. Nixon watch. The unique texture to this Line & Dot jumpsuit (which is also 60% off!) 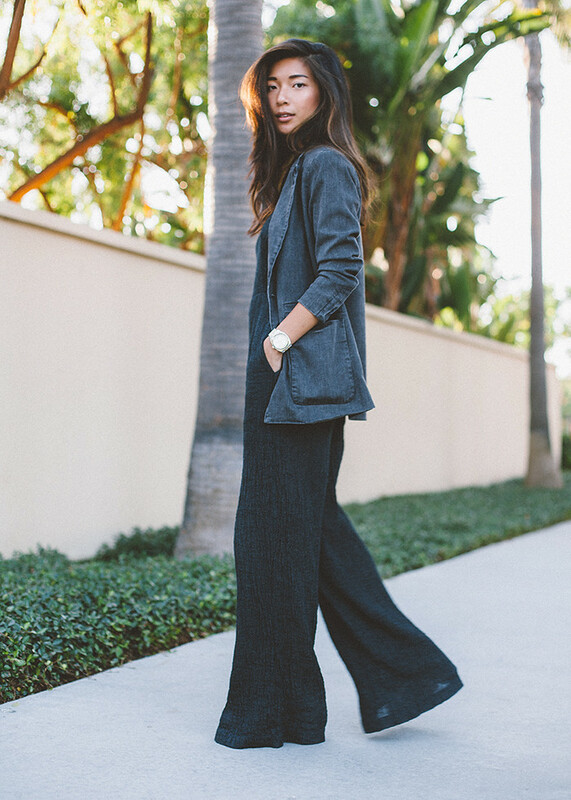 unflattens the dark neutral look and this stretchy denim blazer from Rachel Comey (similar here) remains to be the most comfortable professional-looking outerwear to be made. It's the perfect outfit to go into fancy lunch meetings that says "I'm an expert, I'm polished, and I know how to sip a whiskey." Concealing all the diapers in a chic French tote. Sitting content in pretty new things. Hanging with our little Easter bunny! © Honey & Silk™ 2011-2017. Powered by Blogger.